When your furry companion needs more exercise, consider dog day care. Sherborn residents know they can trust the team at Doggy Dates to deliver premier doggie care services. Our doggie day care in Sherborn offers more than a typical dog walking experience. We specialize in bringing friendly dogs together to do what they do best – play! With several different services designed to fit all your dog care needs, we know you’ll find exactly what your dog needs when you contact us to schedule a free trial. Nothing can replace the feeling of knowing your dog is having fun and is well cared for when life calls you away. In a typical playdate meetup that our dog day care in Sherborn hosts, our dog care supervisors will come to you to pick up your furry family member. Depending on your arrangement, our bonded and insured team members can pick up your dog while you’re at work or we can greet you at the door ready to go. Each of our canine companions sits in its own compartment in our company-branded Scion XB for safety and security before their adventures at our doggie day care in Sherborn. Many of our current guests’ dogs know when playdate day is and they wait at the door to see us! We take our playdate members to an acre of fenced play area in the countryside for a free-roaming adventure with their furry buddies. At the end of our morning, midday, and afternoon sessions, we’ll chauffer your tired but happy dog back to your home for drop-off. We can even put your dog back in his or her kennel or in a certain room if you’re not at home. Our doggie day care in Sherborn offers pickup and drop-off flexibility for your convenience as well. When the days end at the doggie day care in Sherborn, many of our team members serve as overnight stay specialists. Each trained overnighter may host a few dogs at a time for daytime, weekend, and extended weekend stays. We ask that our pet owner bring their dog’s necessities (food, toys, bedding, etc.) and we’ll take care of the rest. Our overnight hosts treat their guests like members of their own families. Unless you have strict rules about furniture, the dogs have free run of their overnight homes. Our overnight stays give your dog a warm and homelike environment during your time away, instead of an unfamiliar vet or pet hotel environment. We will play with your dog, maintain normal schedules, and never leave the dogs home alone for more than a few hours at a time. When it comes to dog day care in Sherborn, you won’t find another business model that gives your pet such a warm and loving environment. As you search for a company for dog day care in Sherborn, many places highlight their added dog spa experience or their longevity in the business. We believe wholeheartedly that passion is the key to managing successful doggie day care in Sherborn. Doggy Dates focuses on providing a natural and fun environment for dogs and making the day care experience memorable for the dogs and their owners. Peace of mind. Strong policies for vaccinations and dog-aggressive behaviors minimize the risk of illness and fights onsite. At Doggy Dates, we require evidence of current vaccinations and a copy of rabies vaccination information. We may train dogs that struggle with aggressive behaviors, but we do not allow any dog with a history of aggression to interact in our group play sessions. Relatable and friendly staff members. If you don’t feel 100% comfortable in the people you interact with, you may not feel confident leaving your dog in their care. The staff members at our dog day care in Sherborn offer experience and unrivaled enthusiasm. We look forward to interacting with all the dogs we serve, and we strive to create friendly bonds with each guest. Your dog will love coming to our dog day care in Sherborn, because we put their happiness first. Affordable pricing. 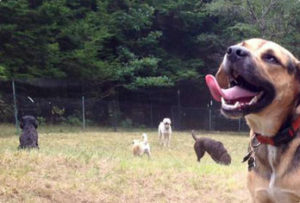 Some centers for dog day care in Sherborn charge exorbitant rates for one-off, playdate, and overnight stays. Since we use our own homes for overnight stays and we own the private land where we take the dogs to play in the great outdoors, our overhead costs are lower than our competitors’ costs are. We pass those savings onto you without sacrificing quality of care and customer support. At Doggy Dates, we offer wholesome, community-supported day care services. While our dogs can’t leave their own written testimonials, our site includes many photos of contented dogs playing outside and relaxing in home environments. Read about our client experiences, too. At our doggie day care in Sherborn, every day is an opportunity to make our human and animal clients’ lives a little better. We hope you’re as excited about our business model as our team is. We’ve been in the business since 2011, and we love getting to know the people and the pets in our community. Remember, the first visit is free. Give us a chance to show you what makes Doggy Dates so special, and we know we’ll become your go-to dog day care. Sherborn locals can reach us at (781) 801-2526 to learn more about our services.